What do Pra Khun Phaen Ban Grang and Pra Putta Chinarach have in common? Comments Off on What do Pra Khun Phaen Ban Grang and Pra Putta Chinarach have in common? 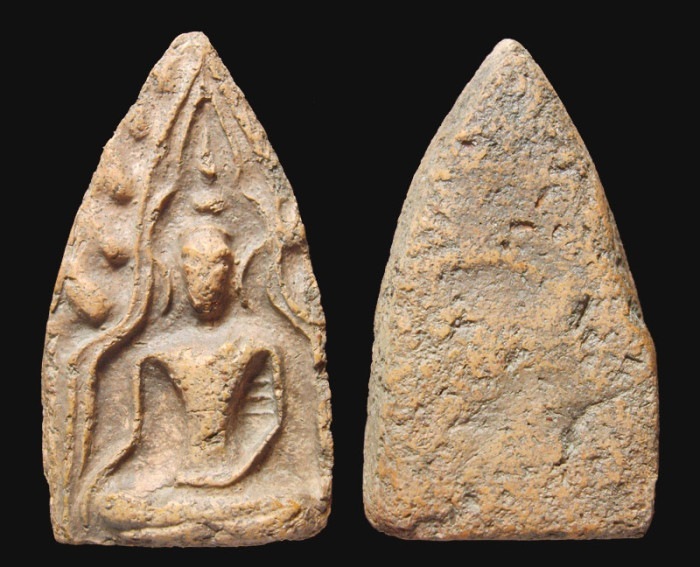 Has anyone ever taken the time to compare the image of Pra Putta Chinarat with the Pra Khun Phaen Ban Grang amulets? You may get a surprise! In fact, the Pra Khun Phaen amulets we know in the present day all took their name from the Pra Khun Phaen Ban Grang amulet, which in turn got its name from local villagers when the Kru broke open and the amulets were discovered. The amulets were not given this name when they were created. Because of the successful business and Maha Sanaeh Seductive influence which devotees noticed coming from the amulet, they name it after the legendary Khun Phaen, of the famed Khun Chang Khun Phaen Legends, who was so famously adept at Magically seducing lovers and customers. 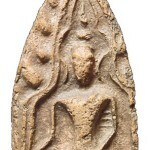 It is a convincing theory that the Phra Khun Phaen Ban Grang amulets are in fact representations of the Pra Putta Chinarat Sum Ruean Gaew Buddha – check the arch and the posture of the Buddha. 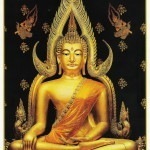 Notice the long flamed spire on the top of the Buddhas head. Notice the upwardly curving palm of the hand on the lap, the long fingers of the hand on the knee..
After wearing the amulets, many people began to tell tales of their experiences of success and miracles, and compared the magic charm of the amulets to the charm of Khun Phaen who had so many ladies courting him. In addition to being an analogy to love charm power, Khun Phaen was also a denizen of Supannburi, where the ban Grang amulets come from, which is typical that local devotees wished to connect the amulet with their local history.